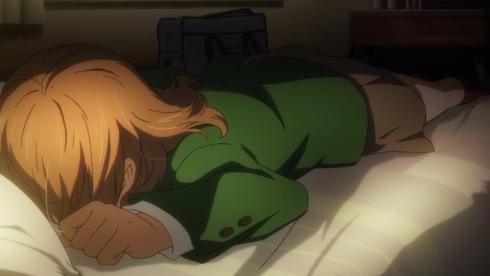 It’s always a relief when your expectations are met, and I’m happy to say the orange adaptation has done just that, endearing me to its cast and sucking me into its story all over again. It’s easily one of my Top Three favorite shows of the summer (nestled right alongside gangsters and puppets; go figure), so I’ve opted to cover it for Anime Evo this season. Also, sorry it’s a little late–I had a busy travel weekend and couldn’t find the time until today. I’m in a unique position with this one where I’ve actually read the entire manga, but anime newbies can rest assured that, while these posts do assume you’ve seen the episode(s) under discussion, this is a manga spoiler-free zone. So viewers and readers can read on free of worries! 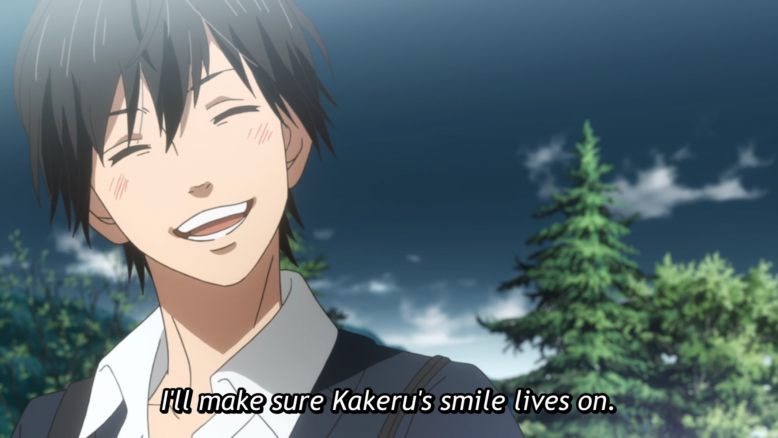 In other news, I’m founding the Protect Kakeru’s Smile Brigade. Care to join? These two episodes revealed some major details about the future Naho wishes to correct, so let’s start with that. 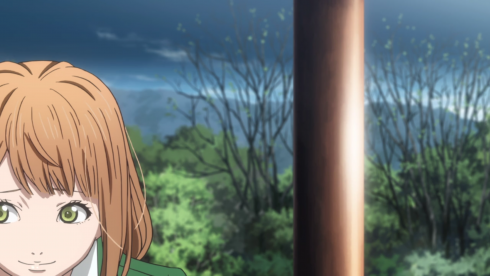 As the premiere pretty heavily implied, we find out in Episode 2 that Kakeru is “no longer with us.” Naho’s request to her younger self isn’t just about dealing with minor regrets, then, but about the much greater task of figuring out a way to save someone’s life. That she thinks she can save his life suggests what the final scene of Episode 3 reveals: Kakeru’s death wasn’t an accident, but a suicide. Future Naho believes if she’d “watched him more closely,” she could have seen the warning signs and done something to save him. And while she only tells her past self about the “accident” (maybe not wanting her to panic or react in a way that’d push Kakeru away? ), she asks her to “watch him” the way she wishes she had. Back in the current (past?) 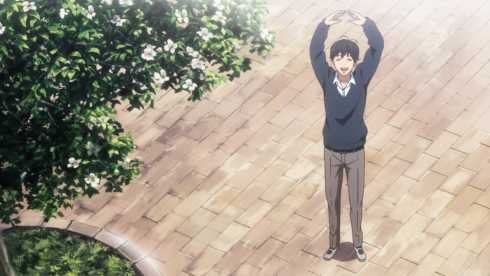 timeline, High School Naho does her best to use the letter to navigate her life and relationship with Kakeru, working to erase her future regrets. And, slowly, things start to change, mainly because Naho lives more boldly, less afraid of what might happen if she does something and more concerned with how she’ll later feel if she doesn’t. One of the things I like about orange is how it interacts with audiences at just about every age, encouraging us to simultaneously put ourselves in Teen Naho’s shoes and ask “what are the things I’m too afraid to do now–and will I regret that later?” and put ourselves in Future Naho’s shoes and consider what we’d change about our pasts. I’m closer in age to Future Naho than Teen Naho, but I tend to be overly cautious as well, so that question of “will I regret not doing this?” has resonated with me ever since I picked up the manga. It’s even pushed me to be a little more courageous too, I think. 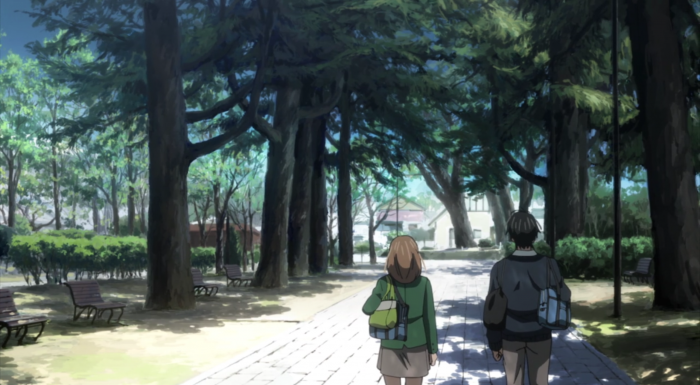 By the beginning of Episode 3, Naho’s choices (to step up to the plate, to give Kakeru his lunch) have created enough of a Butterfly Effect that she doesn’t even need to convince Kakeru to join the soccer club–he’s gone and done it on his own. The letter splits from her own timeline, and she begins to believe she really can change the future. There’s a problem here, though, and one that’s been around since the premiere: Just because you’ll know you’ll regret something doesn’t mean you can suddenly change your own personality, and Naho is still shy, anxious, and indecisive. Even though she eventually does what the letter recommends, she always hesitates. 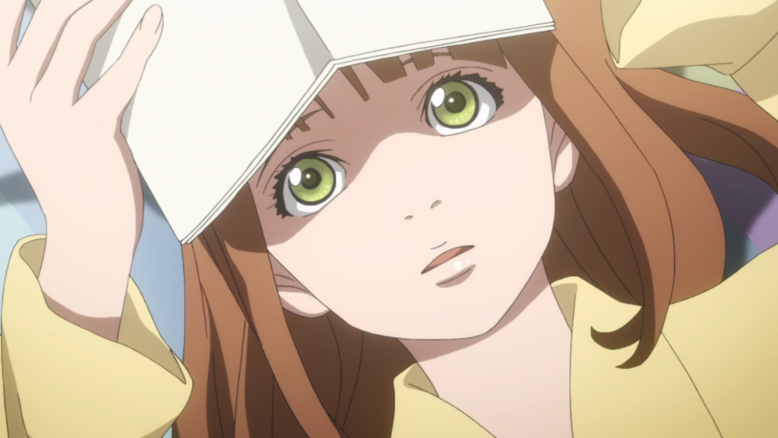 That hesitation finally catches up with her, and her response to Kakeru’s note comes too late. 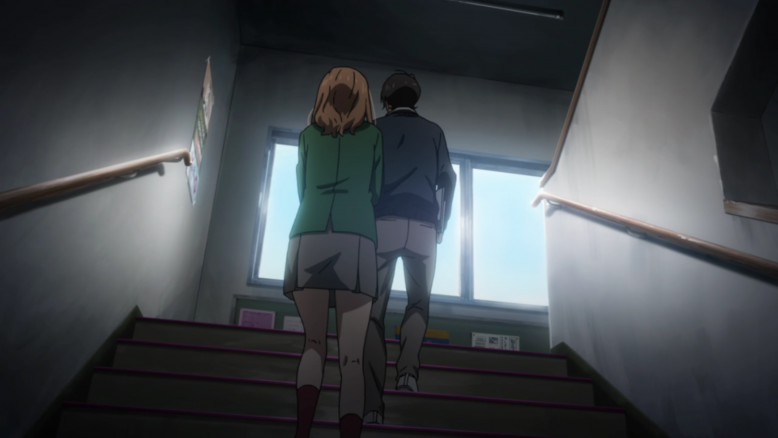 He accepts Ueno’s confession, and the two of them start dating. It’s pretty clear that Kakeru isn’t really into Ueno (he tells Naho as much) and equally clear that he likes Naho as much as she likes him. But after his mother’s recent suicide, Kakeru is also desperately seeking affection, both to validate that he’s worthy of love and to fill the void his mother left, and he’s willing to accept it from pretty much anyone who offers. 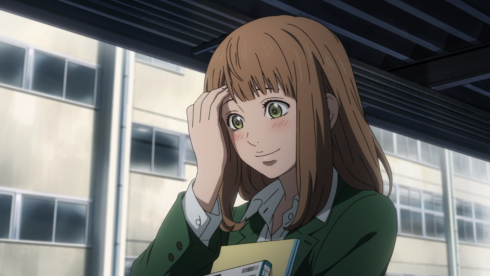 In the end Naho can’t erase this regret, partly because of her own nature and partly because of Kakeru’s. No matter how closely she watches him (and the camera constantly focuses in on his back or face whenever he’s with Naho to show that’s exactly what she’s doing), she can’t know what he’s thinking anymore than he can. 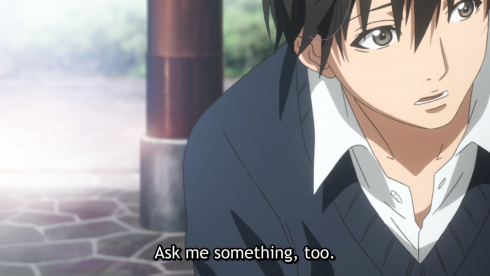 Kakeru has begun to open up to Naho, and he’s encouraging her to do the same–to ask for the sweet bun or the vending machine drink she wants rather than holding back for someone else’s sake. But there’s still a lot of unsaid words there, and they start to feel like a mighty large gap by the end of this week. Sharp light, encroaching shadows, characters only a step apart but not facing each other… Good Shot Is Good. 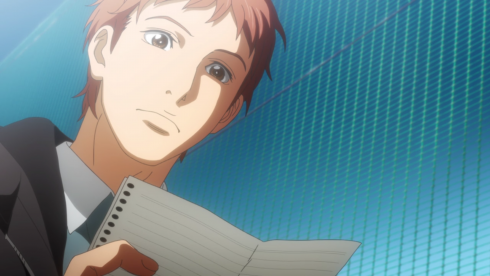 Not content to leave us just with Teen Naho’s failure, orange goes for the double-whammy by shooting forward in time as our gang reads the letter Kakeru wrote for their time capsule. 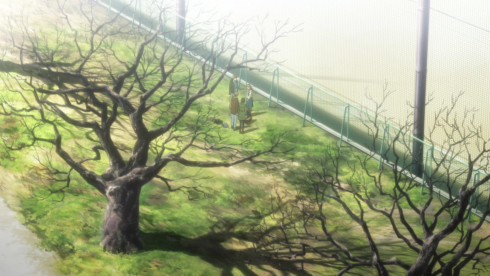 The moment is expertly framed under barren trees, focusing on each person’s face as they slowly realize Kakeru didn’t write to his future self because he hadn’t intended for there to be a future self, followed by their collective grief as they wonder how they could have saved him. Suicide is a delicate topic, but orange handles it well here, showing the pain and guilt it causes the survivors without vilifying Kakeru in the process. His letter to his friends is full of love and hope for all of them. There’s no selfishness or vindictiveness that’s so often (and often inaccurately) associated with suicides; just a quiet sorrow laced through his letter and a perpetual pain to that vanished smile. And it makes this tragedy hit all the harder because of it. The orange scriptwriters love to throw in snippets of dialogue from other students, or have multiple conversations happen simultaneously. While it can make the subtitles a little disorienting, it’s a great way to (1) remind us that we’re only seeing a fragment of the world through one character’s narrow perspective, and (2) suggest that everyone has a story worth telling, and an inner world we may never learn about. Forwards orange’s own ideas about bridging the gap between people very nicely, I think. 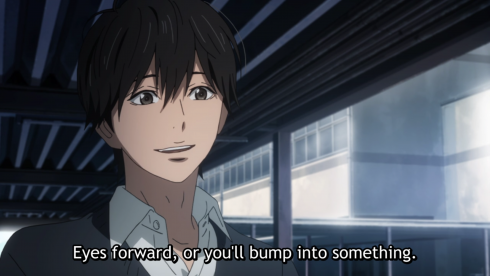 There are some curious choices in this adaptation, like that loooong scene of Kakeru hesitating before unofficially joining the soccer club in Episode 2, which creates these bursts of disjointedness or absurdity in an otherwise measured, down-to-earth series. I like them, but I haven’t decided if they serve a purpose or are just a quirk of the director’s. “NO, Google, I don’t want an Orange is the New Black character list, I want an orange character list! GAWD!” -Me, battling search engines thanks to my inability to remember names. I’m sure this goes without saying, but please be courteous to anime-only readers in the comments section and either avoid spoilers altogether or mark them as such. Thanks!